On this canoe trip we paddle 420 kilometers on the South MacMillan River and 70 kilometers on the Pelly River. During the first couple of days on the river we will paddle some Class III. From then on we’ll enjoy the meandering flow of the "South Mac" and marvel the landscape. Day 1: You will be picked up from the airport and brought into Whitehorse to do any last errands, then we will drive 180 kilometers on the North Klondike Highway to Carmacks. 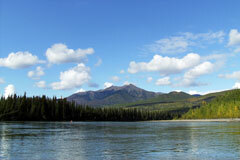 There we will camp at the Coal Mine Campground right on the Yukon River. Day 2: We will drive 230 km to Ross River on the Robert Campbell Highway. En route we’ll take in magnificent views of the Yukon River Valley and the Lapie River Canyon. We cross the Pelly River via ferry before driving on the North Canol Road. This adventurous road, or rather forest trail, takes us another 160 kilometers further north, then we reach the put in for the South MacMillan. Day 3-12: WWe will paddle some Class III during our first few days on the South Mac. Before we paddle any rapids, we will stop and examine each difficult section and decide whether to paddle or portage. When we get to the one Class IV we will unpack our whitewater canoes and carry them past this obstacle. After these rapids the river becomes more gentle and flows at an enjoyable pace. Now we have the time to observe moose, bears, wolves and eagles. In addition, we will fish for grayling and pike. Day 13-15: We reach the Pelly River and paddle 70 km on this wide river to reach our destination. We paddle through a scenic Granite Canyon. Just after we pass Needle Rock there is a nice place to camp at Needle Rock Creek. The following day we arrive in the First Nation’s village of Pelly Crossing. We will overnight at the campground in the village of Pelly Crossing. Day 16: We will be picked up after breakfast and driven 285 km back to Whitehorse on the Klondike Highway. On our way to the city we will stop to see the famous Five Finger Rapids. In the afternoon there is time for you to do some shopping in Whitehorse. Your last night will be spent in the hotel. Day 17: We offer a shuttle to the Whitehorse airport. We offer this tour upon your request. You select the travel dates and group size (5-11 people). The itinerary can be modified to your liking. Please contact us about the price for this trip since it depends on the group size. Prerequisites: This tour is only suitable for people with white water canoeing experience in Class III on wilderness rivers. Good physical fitness is required for portages and paddle days up to 8 hours long. The tour is conducted in expedition style. Short-term changes to the itinerary are at the discretion of the tour guide.